It is said that beauty comes with a price. But did anyone tell you that the price in Japan can be only 100 yen. In Japan, not only cosmetics are prevalent – you can get them with just a mere fraction of your budget, but also, 100 yen stores carry an array of cosmetics for your daily beauty needs. While cheap, it is guaranteed that you will get a good-quality product. Every girl has a chance to copy the look of Japanese girls once you visit the country, without breaking the bank. In this article, we will take a look at some beauty essentials available at your nearest 100 yen store. False eyelashes is a seemingly minor beauty essential that can drastically change your look. In Japan, many women swear by eyelashes and even can’t go out without them. 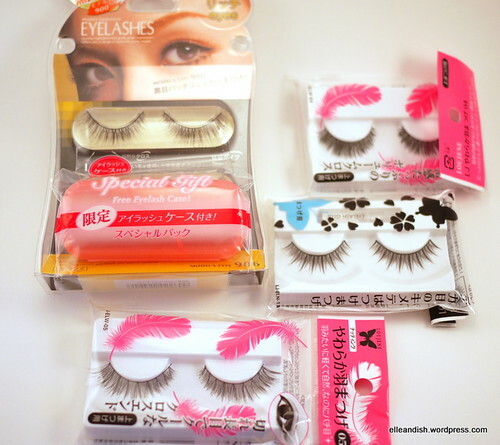 100 yen stores carry not just one, but many styles of eyelashes that you can use from day to night and in any occasion. Whatever you are opting for a dolly or natural look, you’re sure to find something that will fit your taste. Don’t mistake this for a manicure top coat. This is one product that is slowly gaining more and more popularity with women in Japan. The eyebrow coat ensures that your drawn in eyebrows stay perfect the whole day. You just apply a layer of the coat on the top of your eyebrows once you have finished filling them in, and it will keep your eyebrows in check. No makeup arsenal is complete without the famous BB Cream. Booming from Asia and slowly getting recognition worldwide in the past few years, BB cream does not only promise coverage, but most of them even have SPF protection. There are pricey versions of the beloved BB cream, but a 100 yen’s store’s version is almost as good as them – if not even better. So go ahead, visit your nearest 100 yen store (I advise you Daiso)and marvel at the numerous beauty cosmetics available!